Chinese internet cafe chain Wanyoo opened its first UK store in London earlier this year, and Esports News UK had the chance to test out its facilities. 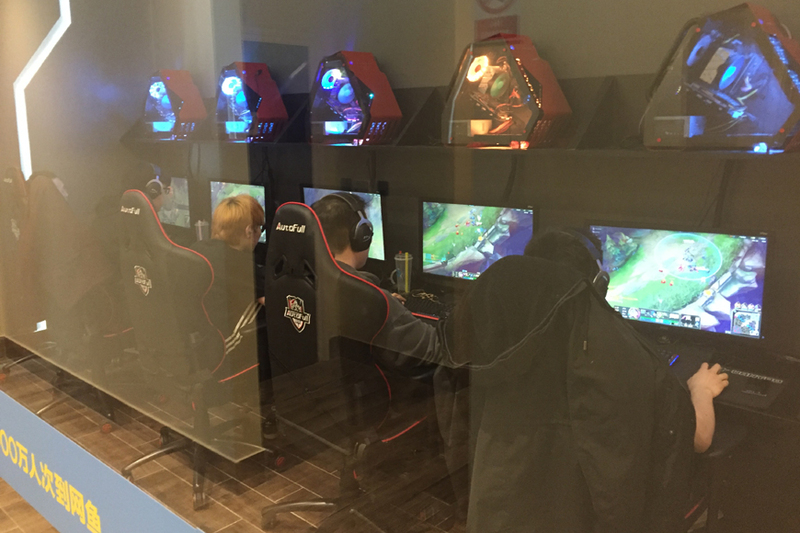 We had a room with five systems to play on during Wanyoo's first £3,000 League of Legends Championship, so there was plenty to see and do on the day. Here's Esports News UK editor Dom Sacco's review of the premises, featuring an image gallery and video including interviews with the store manager, production team London Esports and special guest analyst (and Excel Esports support player) Kasing. Stepping into the Wanyoo Esports Studio for the first time, it feels like a cafe or small restaurant. There are tills and staff greeting you at the front, with various drinks and teas by the counter. But it's of course no regular cafe. There are Fnatic and Invictus Gaming jerseys on the wall to the right, as well as a signed and framced Invictus jacket. A wanted poster is by the counter, offering guests an £80 reward to anyone who can defeat the current 'Summoner of the Week' in a League of Legends 1v1 (an activity which takes place in the cafe every Friday). To the left there are a few tables where people are eating and a 120-inch projector showing matches from the tournament that's going on throughout the weekend. There are a few rows of PCs nearby - this is the public area which is the cheapest option for renting a system (£5 an hour for members or £6 for non-members, which we'll come onto later). The store itself is conveniently located at 77-79 Charing Cross Rd WC2H 0NE, a few minutes walk from the Tottenham Court Road and Leicester Square tube stations, and although it's quiet in the morning, during the afternoon it gets busier and all the rooms are taken during my visit. The store manager tells me: "There are 88 PCs across the two levels, with 500sq m of space. There are 5,000 members registered already and we get 400 to 500 people in store every day." Despite the numbers of people, the cafe is very clean and tidy and there are no unwanted smells, even in the closed-off rooms downstairs. "There are 88 systems - Wanyoo has spared no expense. They run games very smoothly on the large monitors and the 1Gbps internet access means there's no lag or anything like that." Speaking of downstairs, the lower level is arguably the most impressive of the two levels. There are several private rooms down here which include five systems (one room has six) plus a couch. The lower level is circular, with rooms all around the edge and a main room in the centre, which is being used for the League of Legends tournament today. Will 'viperoon' Whittingham is casting in here and is joined after the matches for some guest analysis by Raymond 'Kasing' Tsang, pro player for Excel Esports. The first room on the left as you go downstairs also has the London Esports organisation in it today as they are helping with tournament production. There are also several two-seater booths down here, ideal for duo queueing with a friend. Onto the systems - as mentioned there are 88 of them. Wanyoo has spared no expense here. They run games very smoothly on the large monitors and the 1Gbps internet access means there's no lag or anything like that. You can also log onto the venue's WiFi from your own devices - several people (including a wild Innaxe which appeared) were watching the LEC on their phones while we were playing with no problems at all. The systems have several games installed including League of Legends, Overwatch, Fortnite, World of Tanks and more, as well as the usual programmes you'd expect like Discord. There are some systems that include the super-high-end Nvidia GeForce RTX 2080 cards - these cost £1 more per hour than the usual fees to use. A couple of our systems in our private room did break down at one point after a normal League match (Excel performance coach Jon Ellis was probably carrying us too hard for the PC to handle). Thankfully, after pressing the assistance button by the PC, a member of staff was with us within a minute and the problem was soon fixed. Wanyoo has a clever set-up here. I spent all day at the studio and it's very easily done. We didn't even leave the place for lunch - we just walked back upstairs and ordered some food from the counter then went back for more League of Legends. You can eat in the area upstairs or take your food to your desk. There isn't a huge variety to choose from but what's available is tasty. There's chicken curry, black pepper beef with rice, braised pork on rice and chicken with three-cup stewed rice, all for about £7 each. Drinks include various teas such as green tea and the store's signature iced lime black tea (which my friend loved, but he was gutted there was no coffee available and that was a shame for a cafe not to have some coffee). Onto the prices. Membership is free - all you need to show staff is some ID and you are given a membership card. You can top up your acccount whenever and just use the cafe's facilities without having to pay each time you attend. The public area near the entrance costs £5 per hour to hire, the duo booths cost £6 per person and the battle rooms and private rooms cost £8 per hour per person. There's also a board game room we haven't spoken about in the far corner upstairs which costs £60 per hour. "Wanyoo has a clever set-up here. I spent all day at the studio and it's very easily done. We didn't even leave the place for lunch - we just walked back upstairs and ordered some food from the counter then went back for more League of Legends." Wanyoo wants to host more events at the studio, like the League of Legends Championship - of which it says there will be more - and the PUBG meet-up next week. Visitors will be able to meet the four leading Chinese PUBG teams (4AM, 17 Gaming, OMG and CL) on April 12th. They will also train at the studio for the FACEIT Global Summit from April 10th to 13th. Overall I have to say I was very impressed with the Wanyoo Esports Studio in London. This article might seem overly positive with a lack of constructive criticism, but it's honestly very good. My only real criticism would be the lack of coffee, drinks and space, but part of that will be rectified as Wanyoo is planning on opening more stores in London and also one in Coventry later this year. My friend who came with me today is fussy and he was left impressed with the studio. We'll definitely be back to visit again.